Do you seek innovation, growth and better results? The authors, both Senior Fellows at UC Berkeley, created this book out of a course they created for the MBA program at the Haas School of Business. 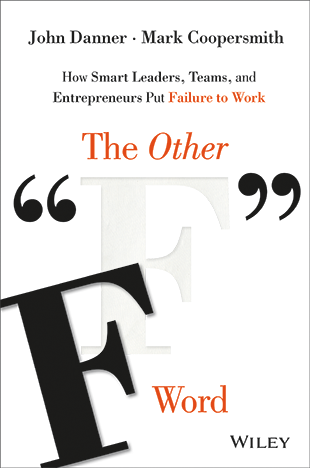 The Other F Word draws on research and interviews with leaders who leveraged past failures to drive stronger performance. Failure’s like gravity – pervasive and powerful. Whether you’re a leader or team member of a startup, a growing business, or an established enterprise, failure is today’s lesson for tomorrow. The Other F Word shows you how to apply this lesson and ensure success in your organization. Read below for testimonials for Mark’s book, or visit the video gallery to watch Mark present this topic through interviews and keynote presentations. Additional praise from Steve Blank, Vivek Wadhwa, Tammy Erickson, Randy Komisar, Charlene Li, Scott Delman, Linda Rottenberg, Kare Anderson, and more. The first chapter of The Other F Word is available as a free download at: http://theotherfwordbook.com.